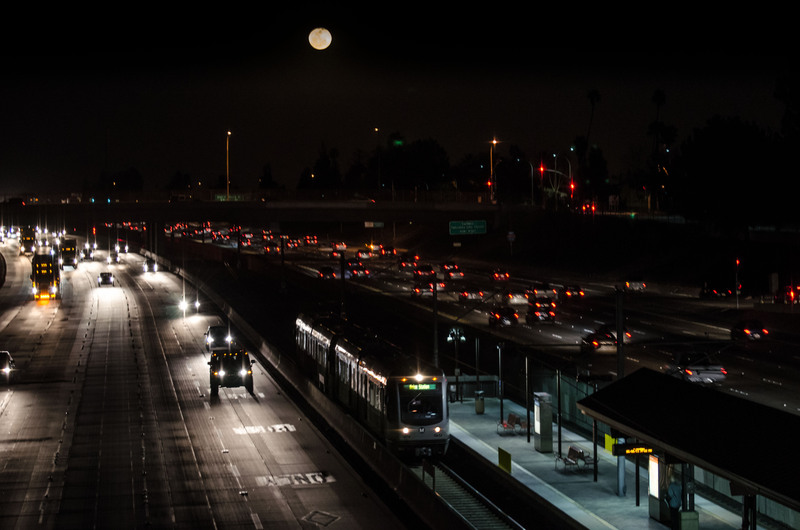 ART OF TRANSIT: A full moon hovers over the Gold Line’s Lake Avenue Station in the middle of the 210 freeway in Pasadena. No, I didn’t add the moon in Photoshop — it was there and it was orange-ish. I’ll try to get a shot next month of the moon closer to the horizon; my timing was off last night. Click above to see larger. Photo by Steve Hymon/Metro. Nice gallery of photos of work on the Wilshire flyover ramps that should make it easier and safer to exit and enter the 405 at Wilshire. The ramps will also hopefully ease some of the congestion at the Wilshire underpass of the 405. Carmageddon I and II — the freeway closures to demolish the Mulholland Bridge — got a lot of the media attention, but I suspect that the Wilshire ramps will be the improvement that most Westside motorists appreciate about the I-405 Sepulveda Pass Improvements Project. The Obama Administration believes that the key is to give people choices–better transit options, more buses and bus stops, incentives for carpooling and van pooling. In this case, the HOT lanes that FHWA supported offer a choice of free or tolled lanes to motorists. As more drivers choose the option of avoiding congestion by choosing a tolled lane, it actually reduces congestion on the free lanes at the same time. We think it’s a very interesting solution, and across the country state departments of transportation seem to agree as the move to add HOT lanes continues. Good post from earlier this month on studies that show as the number of people who drive to a downtown area increases, the number of people actually working in downtown decreases. The problem: too many parking lots taking up space that could otherwise be used for offices and buildings that contribute to the critical mass that downtown areas thrive upon. This article, me thinks, applies directly to downtown Los Angeles — which has far more parking than is actually needed.